Writing an in-depth tutorial, review or a guide is beneficial for both your blog and your readers. Long form content is not so easy to put together, mainly because it requires a lot of research and work to put in but once you publish it, it starts to pay off. Google after its panda update designated that low-quality content won’t be ranked so well. It now only ranks high-quality content which can satisfy user intent. Longer content (A copy between 1500 to 3000 word count) tends to be more informative compared to short from content and that’s one of the reasons they rank so well. However, that doesn’t mean publishing insanely long content will make them rank first in SERPs. Quality is equally important as quantity is. Whether you are a marketer or a blogger, you’ve been watching how creating content isn’t enough to get organic search traffic. In-depth content is what you should put effort on. 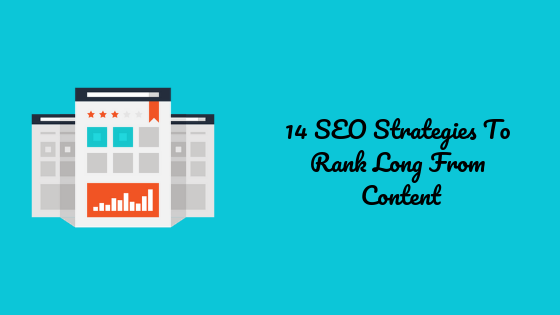 In this article, you are going to learn 14 powerful SEO strategies to rank long-form content higher. Page speed is one of the biggest factors in ranking your content. Google officially stated it is an SEO ranking signal that page speed is very important if you want to see your pages climb up to number one position in SERPs. Long form content will have more text and images so make sure you compress images and HTML/CSS. If your pages take more than 2 seconds to load completely, you are in the red zone. Faster websites result in more conversion while slower will have a negative impact on your visitors. A fast web page will help you reduce your bounce rate and increase your page time. Start by switching a better host. Managed web hosting is amazingly helpful to dramatically increase your page speed. Using cache, image compression, CDN some other speed optimization techniques you can make your site even faster. When you link out to some other website’s pages from your blog posts is called outbound linking. Outbound links help search engines better understand your niche. Linking out to authority sites is beneficial for you as well as your readers. They help add value to your content and more help search engines identify the main key point you’ve written about. While very few bloggers do this, you can make your blog post a high-quality page which connects a reader to similar topics. The only thing you need to remember while linking to other sites is their niche and quality. Always try to link to sites that are similar to yours and have some level of authority. If you are not sure about a page’s authority or you’re linking to an affiliate product, you can use a nofollow tag so that search engine bots don’t follow it. Internal links are highly important for on-page SEO. Linking to your own blog posts to one another using anchor text within your blog posts is called internal linking or inbound links. They connect one page to another and your content gets more easily indexed. It also helps users travel between similar pages and look around content that is equally useful for them easily and quickly. See if you want your content to be ranked, it first should have a readable structure. If your blog is not properly structured for navigation, crawling and it makes hard to find different areas of your website, you need to change it. Immediately. A proper theme is the first thing you can switch to. Choose a fast, clean and SEO friendly WordPress theme which also has lastest schema added to it. It will help your blog look much cleaner, your readers will be able to find what they are looking easily and it will help your page load faster too. Another thing you can keep an eye on is your font. In case of long form content, people will spend more time while reading so you need to make sure your font is readable and is not giving stress on their eyes. Make your URLs SEO friendly by cutting unnecessary word form it. Before publishing your blog post, edit its URL and make it as short as possible. A maximum of 5 words would be a general rule of thumb. Long URLs filled with dates and other words (such as stop words) may not be the best thing for your content. Shorter, cleaner and keyword containing URLs can help users and search engines better understand your content topic. Put your target keyword in it. If possible try to exclude numbers such as dates from your link. It is always recommended to start doing keyword research if you want more search traffic for your content. For long-form content targeting long tail keywords would be highly beneficial to rank for multiple keywords. Create your content around a seed keyword (exact match keyword) and by using tools like ubersuggest and long tail pro to find and a few long tail keywords in your content. Long tail keywords are less competitive, easier to rank and still drive targeted traffic. You should spend time finding long tail keywords as it is one of the initial stages in any SEO strategy. Unlike long tail keywords, LSI keywords are semantic keywords meaning they are similar to a seed keyword and help a search engine understand what exactly your topic is. A popular example is Apple. Apple is a company and a fruit as well. When you write about Apple and its product, adding words like iPod, Mac etc. are LSI keywords that correlate to Apple as a company. Adding LSI keywords will help your long form content rank for your target keyword as well as will help you rank for more similar keywords. Hence resulting in more organic traffic for multiple search queries. Since after Google’s Hummingbird algorithm update it focuses on user intent to determine where to rank your page. Google now focuses more on interest and contextual sense of user queries which is a big reason to add them. A popular tool for finding such keywords is LSIgraph which you can use for free. Voice search is the future. Voice search is growing every day at a very high scale and speed. People prefer to say and search rather than typing. Typing is time taking, voice command is quick and easy. That’s why you need to optimize your long form content for voice search. Writing your copy in a conversational tone is the key to get started. Direct answers to questions, conversational words and switching to HTTPS is how you can make sure your page becomes a choice for a voice search result. You simply should not ignore voice search SEO. HTML tags are very important for SEO. If your blog posts have a title wrapped up in any HTML tag other than H1 you need to fix it. HTML tags go from H1 to H6. Generally, your post title which is your heading should be wrapped up in the H1 tag. Any subheadings in the piece of content would be then wrapped up in H2 or H3 tags. The keyword you add in your H1 tag has a significant weight and Google gives more attention to it. So put your headlines inside H! tags instead of H2. There should be no more than one H1 tag in your content. You can add multiple H2 tags, though. Subheadings are vital for improving the readability of your blog posts. In case of long form content, adding such headings will let you divide your complete content into multiple sections which will make it easy for your readers to read and digest. Subheadings are general H2 – H6 tags where H1 is your primary heading. You can use multiple H2 tags for different subheadings. A good thing about them is that they are a good separater for text blocks. If you go on writing without any subheadings, it will be difficult for someone to navigate through different sections of your content. People skim rather than reading and adding subheadings in your content will make your readers happier than you think. The more the readers stick to your content the more faster your page will start ranking better. The number of websites without an SSL certificate is huge. And you definitely don’t want to be a part of them. Google Chrome starting from 2018 marked websites without an SSL certificate as “not secure”, which has a negative impact on your reputation, page views and almost everything. Move your blog and website to HTTPS by migrating to a more secure web host. I find Siteground to be the best of the few web hosts that give free SSL certificates and website migrations. It will help your pages rank above the insecure pages as well as rank in voice search results. Schema markup lets search engines better understand the type of your blog posts. If you publishing a review and add schema to it, Google and other search engines may pick that up and show start ratings under your post in SERPs. Schema markup tells the search engine to display a search result in a more broad form. It may be a list of table, display the price of a product, display the time frame of a recipe and so on. Not only it helps search engines but it is more beneficial for users too. Before clicking on a result they actually know what they are going to read. It helps to take them a better decision. Your social presence and your brand popularity on social media is an important factor in where Google ranks your content. How many social shares your content is getting has a significant impact on its ranking. A good thing about long form content is that it attracts more shares than short form content. Because people spend more time reading your content and that it is more in-depth they tend to share it on their social profiles. You can leverage your content’s share by adding floating share buttons on your blog. There are many social share plugins and tools but I recommend social snap. It is fast, easy to use and comes with detailed analytics to show you where your content gets the most shares. If you post content without an image, it’s not going to rank as high. It has to have any kind o multimedia in it. Whether it is a video or an image. Images are better at explaining a situation, giving a demonstration and help your readers to better understand your topic. Videos do a lot better. If you can, try to add a video explaining about the topic you have written. Its very effective in explaining what you are trying to teach or what message you are trying to convey. Add at least one image or a video in your content. In long form contents, there’s room for many images and a couple of videos. An image at every 200 – 300 words least would do the job. Be consistent, original and unique. Start publishing more long form content. It definitely takes a lot more time to create and put together but at the end, the results are far more amazing than a short form content. SEO is not fixed to on-page optimization. You need to promote your content, get more backlinks are increasing your domain authority if you want your content to rank top of others no matter what niche you are in. Share your favourite long-form content SEO tip in the comments section below.